The Michelin Dynamic Sport Folding Tire is a versatile durable road tire designed for high mileage. Featuring a semi-slick tread pattern with a smooth center rolling patch with textured shoulders, the Dynamic Sport offers road-rated grip with outstanding durability, all in a lightweight package thanks to its folding bead. 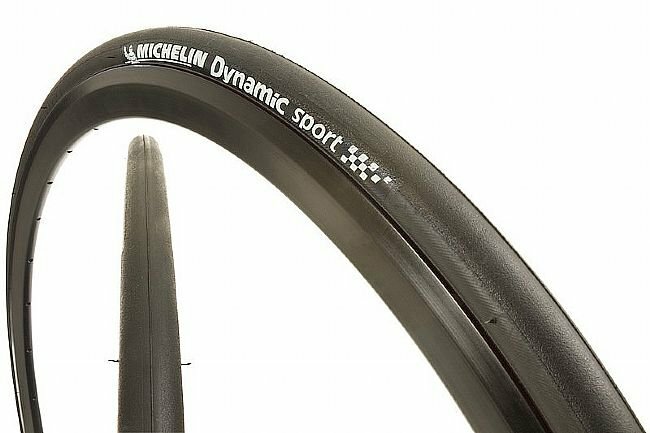 The Michelin Dynamic Sport Folding Tire is available in two widths: 700x23mm and 700x25mm. High-mileage road tire engineered for long-lasting durability. Semi-slick tread with textured shoulders for optimal grip. Claimed weight: 290 grams (23mm). Purchased these tires in 25mm and in 28mm widths. They roll well and grip the road very well, soft rubber tread I suppose. Anyway, for a cheap training tire they have held up well and ride great! They are fairly light and that is always a plus. Durability is probably not that great, but I know I have a couple of thousand miles on each set without incident. We ride mostly chip seal pavement.